19th March 2015, 9.30am – 4.30pm. Ricoh Arena, Coventry, CV6 6GE. Stand E17. One of four regional exhibitions organised by Disabled Living, Kidz-in-the-Middle is a free-to-attend event that provides parents, carers and professionals with an opportunity to see and try out the latest products and services to care for disabled children. This popular Midlands show provides a range of other fun and engaging leisure activities on site along, with a free programme of CPD seminars for healthcare professionals. 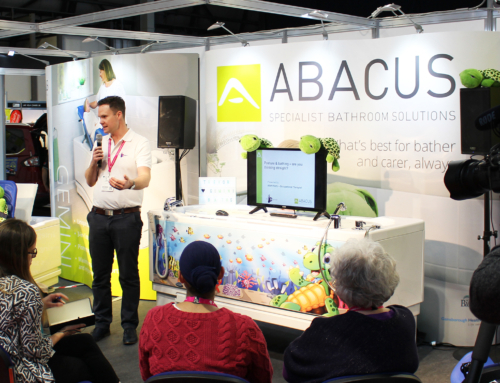 Alongside 130 other specialist exhibitors, Abacus will be demonstrating a number of bath models from our Aquanova bath range including the popular Gemini. This unique bathing solution includes an integrated, height adjustable platform suitable for bathing, drying and changing children in a safe and comfortable manner. It’s variable height operation also ensures carers or parents can bathe children at a safe working height, without the need to bend or lift – reducing the risk of back injury and enhancing the overall bathing experience for all. We have been a long-standing supporter of the Kidz events and our assessors enjoy the chance to discuss individual bathing requirements face-to-face with families and carers. Plus, with the ability to try out our baths and accessories hands-on, visitors to Kidz-in-the-Middle can discover how our baths can make a real difference to the well-being and happiness of disabled children.